[S190] Index - GRO and Office of National Statistics, England & Wales Civil Registration Qtrly Indexes, Birth: District of Edmonton, Vol 5e, p442, 2Q1950. 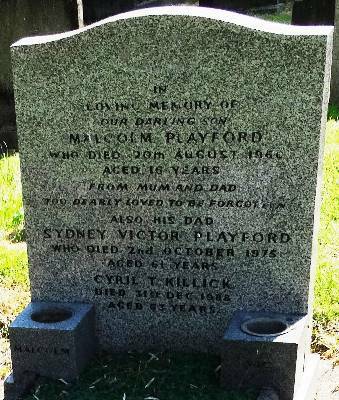 [S190] Index - GRO and Office of National Statistics, England & Wales Civil Registration Qtrly Indexes, Death: District of Enfield, Vol 3b, p143, 3Q1966, aged 16. [S1055] Cemetery Marker - Malcolm Playford Sydney V Playford, St James, Enfield, London. [S190] Index - GRO and Office of National Statistics, England & Wales Civil Registration Qtrly Indexes, Birth: District of Edmonton, Vol 3a, p1329, 1Q1914, mother's maiden name WICKS. [S1044] Census - 29 Sep 1939, UK Register, RG101/0749C/009/13, Letter Code: BEBU, Schedule 97. [S190] Index - GRO and Office of National Statistics, England & Wales Civil Registration Qtrly Indexes, Marriage: District of Edmonton, Vol 3a, p2197, 2Q1946. [S190] Index - GRO and Office of National Statistics, England & Wales Civil Registration Qtrly Indexes, Death: District of Enfield, Vol 12, p269, 4Q1975, aged 62. He and Daisy were divorced before 1949 at England. [S190] Index - GRO and Office of National Statistics, England & Wales Civil Registration Qtrly Indexes, Marriage: District of Surrey NE, Vol 2a, p504, 2Q1940. [S190] Index - GRO and Office of National Statistics, England & Wales Civil Registration Qtrly Indexes, Birth: District of Chertsey, Vol 2a, p104, 1Q1912, mother's maiden name WOOD. [S190] Index - GRO and Office of National Statistics, England & Wales Civil Registration Qtrly Indexes, Death: District of Surrey Nthn, Vol 5g, p355, 3Q1971, aged 59 gives this birthdate. [S1044] Census - 29 Sep 1939, UK Register, RG101/1921E/011/22, Letter Code: DMUB, Schedule 127. [S190] Index - GRO and Office of National Statistics, England & Wales Civil Registration Qtrly Indexes, Death: District of Surrey Nthn, Vol 5g, p355, 3Q1971, aged 59. Louis's second marriage was to Mona May BELL. [S1088] National Archives - National Archive of Australia, NAA Series B883, Service No. 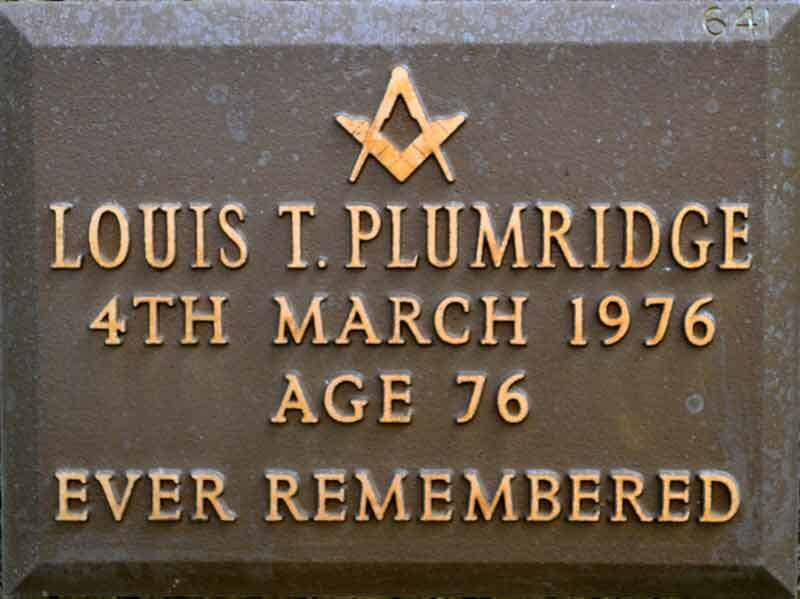 VX101655 gives a date of 21 Mar 1901; but Series B4747, Plumridge/Louis (Army attestation record) give 21 Mar 1900; we accept the Birth Index year (being earlier) and the month/day from these records. [S502] Index - Victoria BDMs online, at https://online.justice.vic.gov.au/bdm/indexsearch.doj, Birth Reg. No. 10722/1899, to Louis PLUMRIDGE and Elizabeth Shaw MCMILLAN. [S502] Index - Victoria BDMs online, at https://online.justice.vic.gov.au/bdm/indexsearch.doj, Marriage Reg. No. 8943/1920. [S362] Springvale Botanical Cemetery database, at https://smct.org.au/, Cassia, Wall ZO, niche 641. [S502] Index - Victoria BDMs online, at https://online.justice.vic.gov.au/bdm/indexsearch.doj, Death Reg. No. 5264/1976, aged 76. [S1054] National Archives - Canadian archives. [S1054] National Archives - Canadian archives, Ontario Births, Series MS929; Reel 124; dau of John POGUE and Eliza Ann DONLEY. [S1054] National Archives - Canadian archives, Ontario Marriages, 1869-1928; Series MS932; Reel 518. [S1054] National Archives - Canadian archives, Personnel Records of First World War, RG 150, Accession 1992-93/166, Box 6889 - 11, item no. 154780 (CEF). [S1079] Cemetery Marker - , St James Cemetery, Toronto. [S1139] Email - Patricia (McInnes) Angell, email from Patricia (McInnes) Angell to D Ferguson, from Mar 2018 onwards. [S502] Index - Victoria BDMs online, at https://online.justice.vic.gov.au/bdm/indexsearch.doj, Birth Reg. No. 36006/1890, dau of Geo Arthur POLLARD and Alice PEARCEY. [S1044] Census - 29 Sep 1939, UK Register, RG101/2631E/016/7, Letter Code: ENHX, Schedule 150. [S871] FamilySearch, at https://familysearch.org/, South Africa, Church of the Province of Sth Africa, Parish Registers, 1801-2004, FHL film 5029442, image 178. [S871] FamilySearch, at https://familysearch.org/, FHL film no. 380208, son of Edward and Elixabeth POOLE. [S581] London Metropolitan Archives, at http://www.ancestry.co.uk, Guildhall, St Giles without Cripplegate, Marriages, 1798 - 1812, P69/GIS/A/01/Ms 6421/3. [S667] England & Wales Non-Conformist & Non-Parochial Registers 1567-1970, at http://www.ancestry.co.uk, Registers of Births, Marriages and Deaths surrendered to the Non-parochial Registers Commissions of 1837 and 1857; Class RG 4-3990. [S189] International Genealogical Index (IGI), Batch No: C037161, Source Call No 597086. [S449] Will - Robert Forsaith, UK PRO prob11/1598 image 134. [S448] Will - Mary Smyth, UK PRO prob11/2001 image 306. [S117] Census - 6 Jun 1841, UK census, ED 25 HO107-713-8 Folio 43 p13. [S455] Will - John S Forsaith. [S118] Census - 30 Mar 1851, UK census, ED 1g HO107-1608 Folio 182 p16 GSU roll 193508. [S340] Census - 7 Apr 1861, UK census, ED 13 RG9-463 Folio 114 p36 GSU roll 542643. [S677] Index - England High Court of Justice, England & Wales National Probate Calendar, will was proved at the Principal Registry by oath of Mary Smyth FORSAITH, spinster the sister by half-blood and the sole executrix. [S418] Ancestry.com - misc sources, at http://www.ancestry.com/, Anglican Parish Registers. Woking, Surrey, England: Surrey History Centre. [S1044] Census - 29 Sep 1939, UK Register, RG101/0730H/002/35, Letter Code: BDAH, Schedule 17. [S190] Index - GRO and Office of National Statistics, England & Wales Civil Registration Qtrly Indexes, Death: District of Edmonton, Vol 3a, p1684, aged 57. [S190] Index - GRO and Office of National Statistics, England & Wales Civil Registration Qtrly Indexes, Birth: District of Edmonton, Vol 3a, p1408, 3Q1914, mother's maiden name POPE. [S190] Index - GRO and Office of National Statistics, England & Wales Civil Registration Qtrly Indexes, Birth: District of Edmonton, Vol 3a, p804, 2Q1919. [S190] Index - GRO and Office of National Statistics, England & Wales Civil Registration Qtrly Indexes, Birth: District of Edmonton, Vol 3a, p920, 4Q1922. [S488] Index - Queensland BDMs (online and fiche), at https://www.qld.gov.au/law/…, Marriage Reg. No. 1925/C1915, p3234.